15" Aluminum Type T03 Silver Trailer Wheel. The exact size is 15" x 6" 5 lug on 4.5" / 114.3mm bolt pattern. Max load is 2150 Lbs per wheel. Zero Offset. This listing is for the wheel only. Most common tire sizes mounted on this wheel are 205/75R15, 205/75D15 (F78-15), 225/75D15 (H78-15) and 225/75R15. 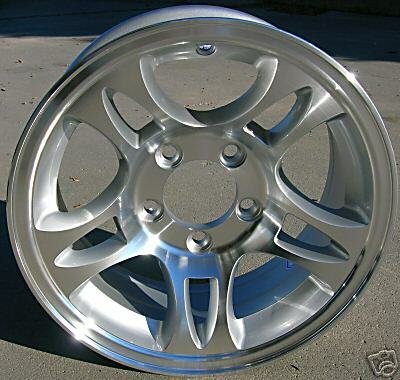 I bought these to upgrade from the 14" stock wheels on my 23' Airstream. Price was right, was a little less (including shipping) than other sources that included 'free shipping.' I ordered on a Monday afternoon, they were on my front step Wednesday (granted I live in Utah and they only had to come from Idaho...but still, very happy that they shipped the same day ordered. Arrived in excellent condition, and are awesome looking wheels. Received my wheels for my camper. Great looking and it has changed the look so much, it looks like a new camper. Received my wheels today. They look better than I expected. Absolutely love them!